Only ground transport Private van, walking. Road travel can be difficult, with long drives and poor road conditions at times. Please take note of the travel times and distances in the above itinerary, and consider that this is often on poor quality, bumpy roads. Despite this, most clients feel that the diversity of the African landscape, culture and wildlife are all well worth the experience. Hotel accommodation will be in simple, but comfortable twin-share rooms. All rooms are equipped with adequate mosquito netting (with the exception of your hotel in Musanze, where mosquito nets are not needed due to high-altitudes). Tented accommodation will be in simple furnished tents on wooden platforms, with shared bathroom facilities. All tents are large, walk-in tents with mosquito-netting, two beds and provided linens. A sleeping bag or extra mosquito-netting is not needed for this tour. Please remember that this is a developing area and as such, accommodations/service may not be of similar standard to which you are used to in your home country. As well, interruptions in electricity and water can be common. We appreciate your patience and understanding as well as your sense of adventure. Guides Chief Experience Officer (CEO)/driver throughout, experienced gorilla trackers, local guides. Min. Age: Minimum age of 15 years for this trip. 1. AGE RESTRICTIONS Please note that all passengers must be aged 15 years or older (prior to start of travel) to go on this tour - there are no exceptions to this as it is for safety reasons and strictly controlled by the Government. 2. PHYSICAL REQUIREMENT This trip is rated a level 4 physical requirement - travellers should be in excellent physical condition, without any heart problems and prepared to spend strenuous days in humid rain forests, steep terrain and high altitude trekking for chimpanzee and gorillas, as well as other primates. Please ensure you meet the requirements as described under "physical rating". 3. TRAVEL DAYS Travelling can be difficult, as long drives and poor road conditions are the rule as opposed to the exception in both Rwanda and Uganda. Despite this, the diversity and scenery of the African landscape, the local culture and abundant wildlife are all well worth the experience. 4. 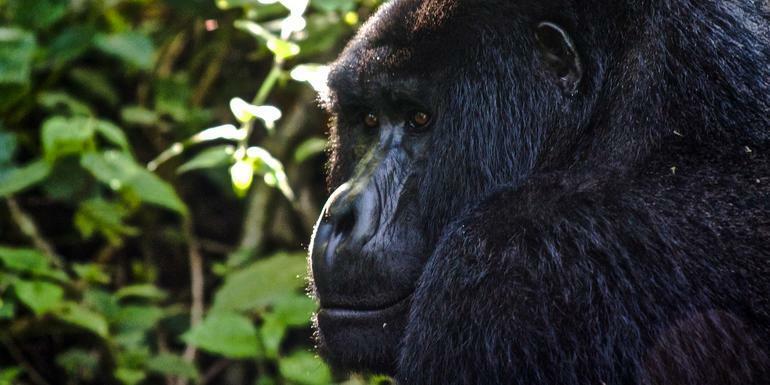 WILDLIFE SIGHTINGS G Adventures can never guarantee the sighting of wildlife, especially when it comes to mountain gorillas. 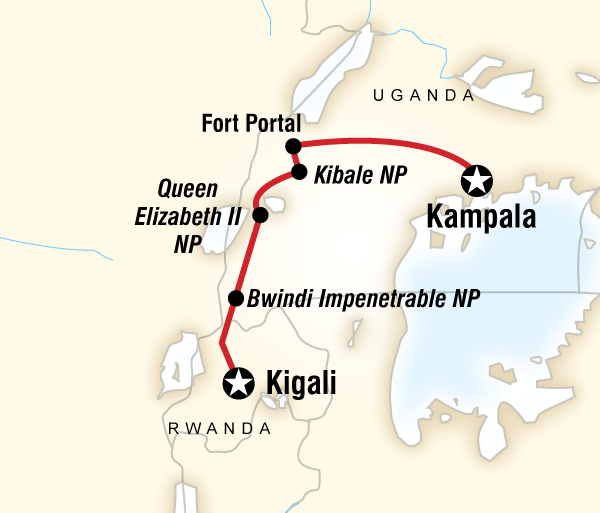 However, the mountain gorilla trek is organized to ensure success. Before heading into the jungle, our local guides receive coordinates from trackers on the whereabouts of the gorillas, and the trackers stay with the gorillas until the group arrives. 5. ACCOMMODATION Much of the accommodation on this tour is in simple furnished tents with shared bathroom facilities. Please remember that this is a developing area and as such, accommodations/service may not be of similar standard to which you are used to in your home country. As well, interruptions in electricity and water can be common. We appreciate your patience and understanding, as well as your sense of adventure. 6. ILLNESS Please note that if you are unwell with anything contagious, even a common cold, you may be denied any of the treks to ensure the safety of the gorillas and chimps. This is a national park regulation, and trekking permits will not be refunded if you are denied entrance due to illness. 7. CAMERAS As it is very dark and damp in the jungle; please ensure your camera equipment is appropriate for such conditions and that you bring dry bags to protect it. 8. ELECTRICITY The power supply in Uganda and Rwanda is nominally 240VAC, 50hz. Variable voltage, spikes and sporadic, unexpected, unscheduled power cuts of varying duration can be expected. 9. YELLOW FEVER Please be advised that it will be required to show a yellow fever certificate upon entering Uganda and Rwanda.